ST. PAUL, Minnesota, July 23, 2012 (ENS) – The 2012 American Solar Challenge, an eight-day 1,650-mile competition for solar-powered vehicles, ended in St. Paul on Saturday with the University of Michigan car Quantum in first place. Held once every two years, the American Solar Challenge follows a different route for each race. The 2012 race started in Rochester, New York on July 14 and passed through all eight states that border the Great Lakes. Solar-powered vehicles from 18 schools competed for the title. U-M’s Quantum crossed the finish line at 2:30 pm local time, breaking its own previous record with a final time of just under 45 hours. Top tested speed for the U-M’s 12.3 horsepower Quantum was 105 miles per hour. The Iowa State University solar car, Hyperion, cruised across the St. Paul finish line Saturday for a second place finish despite a rainy morning. Hyperion was able to overcome hitting a curb on an interstate on-ramp that damaged the vehicle. Finishing third was tiny Principia College, a Christian Science school based in Elsah, Illinois. Also in the top five were University of Minnesota and the University of California, Berkeley. This is the seventh North American title for the University of Michigan team, which won the inaugural event in 1990 with its first car, the Sunrunner. It also was a record-breaking run, as the team finished the race with a 10-hour, 18-minute lead on its nearest competitor, Iowa State. The racers weathered intense rain on the second and last day of racing. U-M took advantage of the weather on day two, acquiring a two-hour lead as other teams, hampered by the rain, were forced to drive slower to conserve their energy. Quantum is U-M’s lightest-ever vehicle. At 320 pounds, it weighs 200 pounds less and is 30 percent more aerodynamic than its most recent predecessor. Powered solely by the Sun, the single-seat race vehicle uses the same amount of energy that it takes to power a hair dryer. Building the solar car is a two year project that takes over 100 student team members and more than $1 million. The vehicle’s body is covered with silicon cells that collect energy from the Sun, convert it to electricity and store it in lithium ion batteries. The rubber that meets the road are Michelin low rolling resistance tires. Always seeking better technology, the U-M Solar Car team is already working its next solar vehicle. Quantum finished third in the World Solar Challenge in Australia last fall, the fifth finish in third place for the U-M Solar Car Team in the World Solar Challenge. With more than 100 students from schools and colleges across the university involved in the project, U-M Solar Car is one of the largest student organizations on campus. 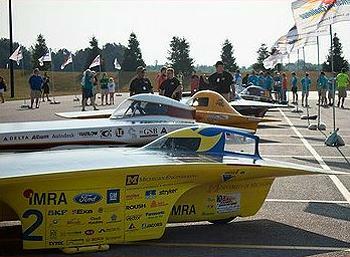 Major sponsors of the U-M Solar Car team include IMRA America, Michigan Engineering, Ford and General Motors.